Libran subjects tend to center their lives around love and relationships. People born under this sign need a partner in order to be at their best and feel fulfilled .Librans are reluctant to select a direction until they are absolutely certain it is the right one. For this reason they tend to be thought indecisive. Librans love to impose a sense of order in their lives-everything must look perfect-appearance, clothing, possessions, home and environment must be scrupulously clean and tidy. Most librans posses a hard, cold, steely core. When they are confronted and forced to show their true colors, subjects of this sign can turn out to be remarkably hard, aggressive, and verbally self protective. Outwardly likable, gracious, and caring, it comes as a surprise when, at the slightest hint of trouble, Librans quickly vanish.To achieve balance in all aspects of their lives is the ultimate aim of most Librans, but sometimes the means does not justify the end. 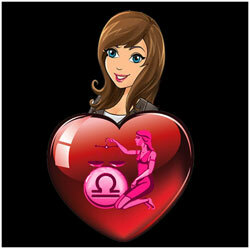 Libras are known to be engrossed and obsessed with love that they love whole-heartedly and yearn to be loved as well. Romance, love and relationships are vital for their very survival. Hence they make sure that they are not single or in solitude and like to sustain a relationship if they are into one. All Libras ask for a very compatible partner in life and would move mountains to get the same. 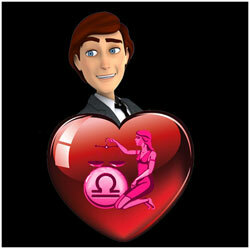 Libra guys are very social and are diplomatic, however in choosing a love partner they are found to be a little blind. Some Libras are so desperate for a relationship that they do not know how to discriminate people. Once in a relationship even if it is a failing one or an abusive one, they are found to cling on to that despite the odds. The Libras though being diplomatic yearn for a calm and balanced life with their partners. Hence they might be dominated by the stronger zodiac signs at any part of their life. If you can strike a balanced environment then there would be a compatible atmosphere around. Libras are also found to flirt and stray in relationships that compatibility with partner becomes a question mark. Flattery can let many Libras down on their knees. You are also so naive that you can be fooled by just about anyone in town as far as relationships are concerned. As for the elemental analysis, the fire signs can get well with the Libras as they are honest, down-to-earth and straight-forward. Libra being an air sign also gets well with the other air signs as there is a better match of mind and matter. If there ought to be a compatible relationship in the life of a Libra then he or she should shed his or her idealistic nature and come to the practical sense. Do get away from your dreams of a perfect 100 percent ideal relationship and face reality for compatibility to thrive, dear Libra. 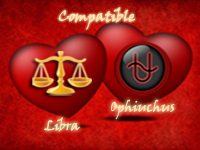 The compatibility between a Libra and an Ophiuchus personality would be just great as both are always in search of new things in life. They are creative, pursue intellect and are highly creative. Also they like to travel and explore places together. Each one stimulates the other mentally and hence the going would be easy. Both of them enjoy the fine things in life, especially arts.